15 AMAZING Shrugs To Pair With All Your Sleeveless Outfits! This story was updated in January 2019. Whether we’re in between grooming sessions, or simply need to cover up, a cutesy shrug always comes in handy! The right shrug has the power to up your glam game in seconds. We’re sure you’ll need a lot of these to cover up when you step out in the sun wearing sleeveless tops and dresses. Here are 15 awesome shrugs for sleeveless outfits that will help you sail through the summer in style! This black shrug with batwing sleeves will add trendy touch to any outfit you pair it with. Team it up with a crop top and high waisted jeans for an easy breezy summer look! Price: Rs 699. Buy it here. A flowy olive green shrug anyone? Give your basic t-shirt and shorts look a trendy twist by pairing it with this comfy, flowy shrug! Price: Rs 975. Buy it here. Beat the heat in style by adding this cream bell sleeved shrug to your summer wardrobe. Pair it with simple jumpsuits or strappy tops for a head turning outfit. Price: Rs 999. Buy it here. Comfortable and stylish, this grey shrug with a fringed hem is for girls who like to make a minimalistic statement. You can wear this shrug with a tank top and jeans for a casual day in college. Price: Rs 540. Buy it here. Ths blue floral shrug will surely add a splash of colour to all your summer outfits. Pair it with a sleeveless top and jeans for a simple and stylish look. Price: Rs 1,299. Buy it here. 6. Black, White & Fabulous! Ditch the basic black shrug and choose this sleeveless monochrome shrug instead. Look at that lovely print! We think you could totally use this as a reversible shrug. Price: Rs 839. Buy it here. When it gets too cold in the movie theatre, you need a simple shrug to keep you warm. This beige shrug will do exactly that! You need a neutral coloured shrug in your wardrobe that you can match with anything you wear. Price: Rs 300. Buy it here. 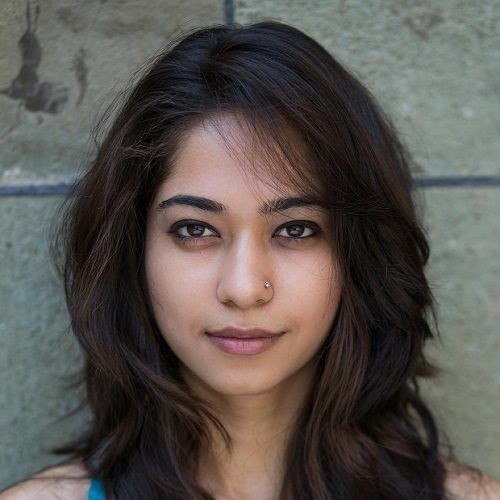 We found the perfect shrug for every desi girl! Put on this shrug over wide legged pants and a t-shirt to nail the fusion wear look! Price: Rs 1,039. Buy it here. Now that’s a trendy shrug we’re sure you would love to invest in! Embellished with tassels and intricate embroidery, this white shrug is hard to resist. Wear it with a crop top and distressed boyfriend denims for a fashion forward look. Price: Rs 1,399. Buy it here. Add a pop of colour to anything you wear with this orange longline shrug. With tassels and a geometric print on the shoulders, this one’s a must have! Price: Rs 1,119. Buy it here. Look summer ready by teaming up this floral shrug with your tank tops and shorts! With a velvet finish and a subtle combination of colours, this shrug has the power to bring any outfit to life. Price: Rs 1,679. Buy it here. A basic shrug will go a long way in your closet. You can add it to any outfit if you’re not waxed or just want to cover up. This blue one is such a steal for this price! Price: Rs 599. Buy it here. 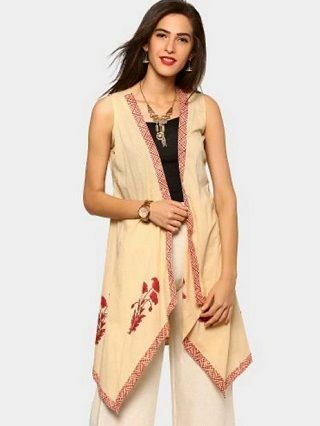 We’re in love with this beige printed ethnic shrug! 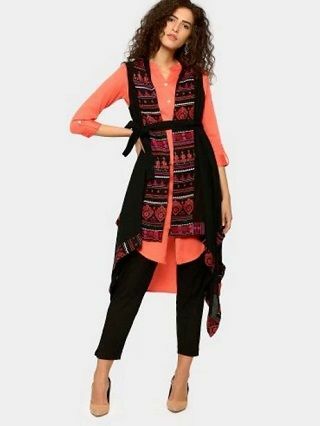 Wear this with a t-shirt and high waisted jeans to add an ethnic touch to the outfit. Don’t forget to wear your favourite jhumkas for a head turning look! Price: Rs 995. Buy it here. This multicoloured shrug with an abstract print is just perfect for the summer! You can wear this with any simple ensemble to add a fashionable twist to your look. Price: Rs 999. Buy it here. You surely do need a shrug to go with your kurta and palazzo outfits. We think this one with a tie up detail is all you need to make any desi outfit look stylish!